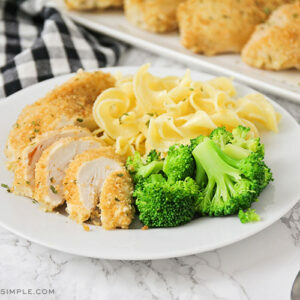 Baked garlic parmesan chicken is an easy dinner full of amazing flavors that's ready in about 30 minutes. Line a baking sheet with parchment or a silicone liner, then spray with cooking spray. Drizzle the chicken breast strips with the olive oil and toss to coat. In a shallow dish or large plate, whisk together the bread crumbs, salt, garlic powder, parmesan, and parsley. Dip the chicken strips in the bread crumb mixture, pressing gently to coat. Place on the prepared baking sheet, and spray the tops with cooking spray. Bake 20-25 minutes, or until golden brown and crispy, and cooked through.